The EU countries have invested $20 billion in Azerbaijan's fixed assets for the last 10 years, that is, 45.6 percent of all investments made in the country's fixed assets, said Shahin Mustafayev, Azerbaijani minister of economy. Mustafayev made this statement at the second Azerbaijan-EU business forum, which is being held in Baku May 18. "The EU countries made direct investments worth $2.7 billion in Azerbaijan's non-oil sector, that is 35 percent of the total volume of direct investments in this sector of the country," he said. "Azerbaijan is a very important country for the EU," Mustafayev stressed, adding that the Azerbaijan-EU developing relations testify to it. "Azerbaijan and the EU countries have held 98 business forums for the last four years," the minister said, adding that two of them have been recently held. "Thus, the Azerbaijan-Netherlands business forum was held May 17," the minister said. "A delegation from the Movement of French Enterprises (MEDEF) visited Baku last week. "All this testifies to the fact that Europe focuses its attention on Azerbaijan." The minister also added that the EU is Azerbaijan's main trade partner. "The share of trade turnover with the EU hit 47.5 percent of a total volume of Azerbaijan's foreign trade in 2015, while 43 percent in the first quarter of 2016," the minister stressed, adding that this is a very high index. Mustafayev said that Azerbaijan and the EU countries signed a lot of agreements on avoidance of double taxation and investment promotion. "Azerbaijan signed the agreements on avoiding double taxation with 23 EU countries," Mustafayev said, adding that moreover, the country signed the agreements on mutual protection and promotion of investments with 18 countries. 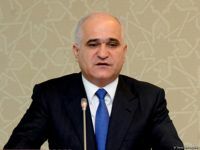 "Azerbaijan cooperates with 14 EU countries in the format of the intergovernmental commissions," Mustafayev said, adding that the country cooperates with two more countries in the format of working groups.